No, I have not mixed up my spelling of “soul” verses “sole”. 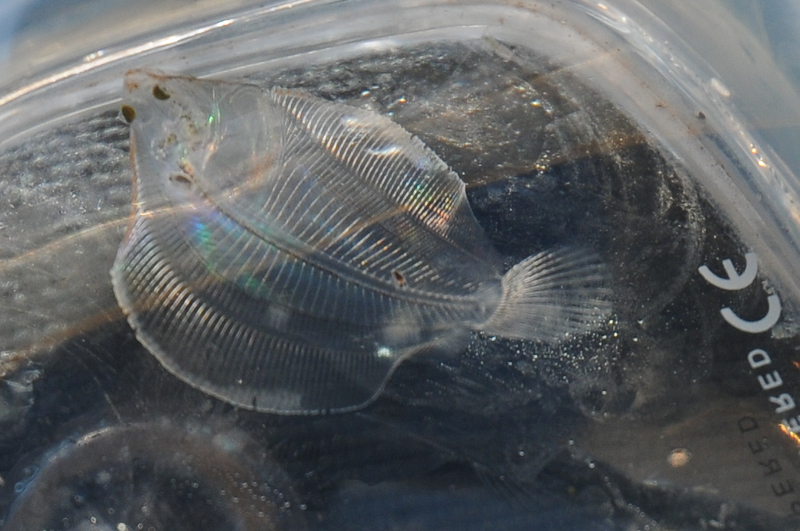 Planktonic sand sole. Only 2.7 cm. This last weekend, while watching herring feed on krill in a tide line, I suddenly noticed a very small transparent fish. Upon closer inspection, I saw that it was a larval form of some species of flatfish. I was able to dip the little guy into my dive mask for a few pictures and, due to the size of the lettering in the mask, I know that the fish was only 2.7 cm. I was in awe of how transparent s/he was; that I could see the bones and heart; and that this small, fragile planktonic stage could ever survive to grow into an adult. These sorts of “finds” are as awe-inspiring to me as any sighting of a whale. The thick planktonic soup of our rich cold oceans is full of the larvae of so many species. Anemones, nudibranchs, sea stars, crabs, etc. – they all start off as zooplankton and the incidence of what sort of plankton are present often gives scientists an indication of what may be happening with the marine food web. It is like a world of hidden secrets to me and of course I wanted to find out all I could. What species of flatfish was this – halibut, sole, flounder? I do not have the expertise to know but, oh so thankfully, there are those out there willing to share their great knowledge. Marie-Josée Gagnon of the Salmon Coast Research Station quickly steered me in the right direction, believing it was most likely a species of sole. She connected me with zooplankton taxonomist Moira Galbraith of the Institute of Ocean Sciences who confirmed that this was the larval form of a Pacific sand sole (Psettichthys melanostictus), a species that can grow to 63 cm. 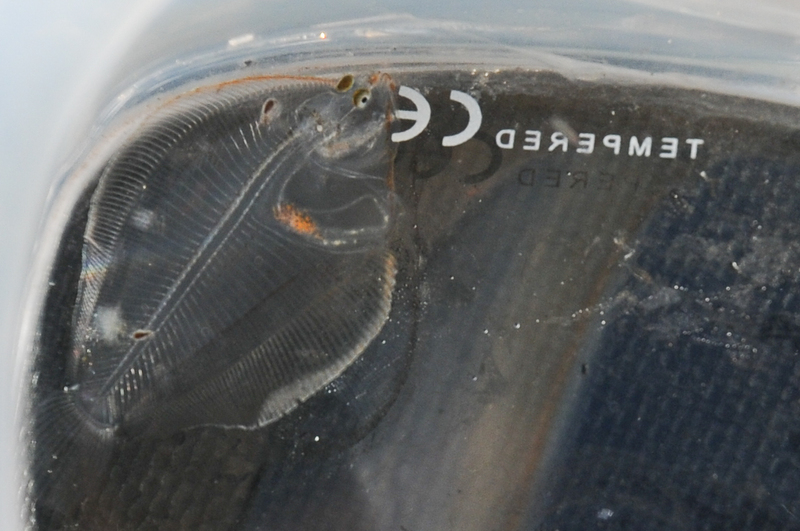 She also shared that the transparency of the larval fish serves as camouflage, reducing the chances of it being eaten before reaching the life stage where it settles to the ocean bottom and hides on and in the sand. But wait, what are those two little zooplankton guys attached to the larval sole? They are copepods, but what kind of copepod? What does their presence mean ? Are they parasitic? And there I go down the marine id rabbit hole. One thing I know for sure though – and forgive me for the following pun because the emotion behind it is very sincere – how I hope this little planktonic fish will be a . . . sole survivor. Ichthyoplankton Information System – planktonic life stages of fish in the northeast Pacific. With regard to the ectoparasites on the sand sole larva, Marie-Josée Gagnon and Moira Galbraith have again been very generous with their knowledge. It is impossible to know the species from my photo but, due to the size, it is likely a recent infection and could be (1) first stage Chalimus; (2) Lepeophtheirus bifidus – which, unlike most parasites of benthic marine species is host specific – only being found on the rock sole or possibly, (3) the isopod Gnathia. I valued having affirmed too that adults and young live in different environments to eliminate competition for the same resources but also to provide a buffer or separation to prevent transfer of disease or parasites. Lion’s Mane Jellyfish – Sherlock You Are Wrong! Caught a couple sole yesterday (from a depth of about 40 ft.) and put them in a bucket of water. Soon there were at least a dozen young sole 3 to 4 mls in length swimming in the bucket. At first I thought they were just bugs or sea lice but on close inspection I’m sure they were babies. Some fish keep their young in their mouth but I couldn’t understand how they could do that and feed so I’m thinking maybe they piggy back on their parents surface. Any idea????? No fish for dinner, poured them back 🙂 ! Hello Stephen, I am as perplexed as you are. Rock Sole spawn, with the fertilized eggs being left unguarded, sticking to whatever surface they were laid on. The young are then hatched into the water column. I promise you that your observations will lead to me paying even more attention to the species when diving. I greatly respect that, after your observations, you chose not to have them for dinner.